We've been hearing about Samsung's smartphone with a foldable screen for what seems like an eternity, but it looks like we'll have to wait a little longer to finally see the thing. Flexible screens have been demoed at trade shows for years, but getting them into a production-ready phone is another matter entirely. Samsung had seemed the most likely to make this dream a reality, but it must be as hard to do as it sounds — the project keeps getting put back. Rumors first swirled that Samsung was planning such a device back in June 2016, and then a few months later we saw patent drawings outlining what it might look like. It was then predicted that a phone with a folding screen dubbed the "Galaxy X" could be a reality by Q3 of 2017, but that was shifted to the first half of 2018. Lastly, in September 2017, Samsung mobile president Koh Dong-jin confirmed that the company was working on a flexible Galaxy Note and might have it ready for 2018. That didn't inspire us with too much confidence, but it was the most official source we'd heard from. The latest in the ongoing saga comes from the South Korean publication The Electronic Times, which states that Samsung has set a schedule to move from development to production and could unveil the phone before the end of the year. Maybe. Or it could be the beginning of 2019. Apparently, the display panels are going to ready by September ahead of mass production for the device starting in November. 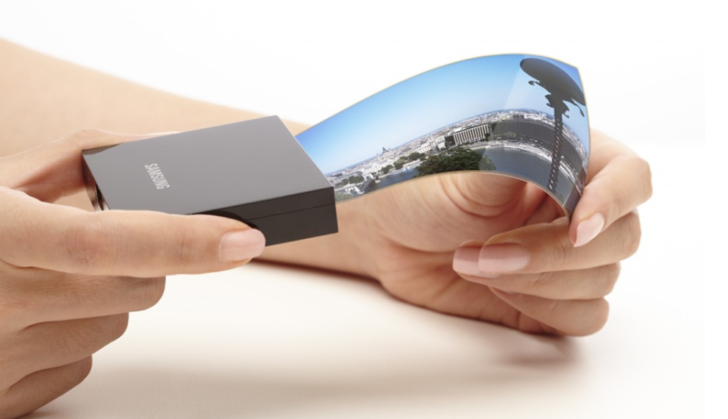 A 7.3 inch flexible OLED display is touted for the device, which can be used folded as a phone or unfolded as a tablet, according to the source. Unsurprisingly, Samsung Display is named as the panel manufacturer. It's not like we were expecting LG Display to be offering up its wares for this. The information comes from representatives of "multiple industries that are familiar with this matter," which is wonderfully vague. It goes without saying that we should take this with a pinch of salt until we hear something more concrete, but it would at least appear that the project is going ahead. Samsung better hurry up if it wants to be first to market, though, as we've already seen working prototypes from Lenovo. There's also the ZTE Axon M, which looks a lot like what the Samsung device will be trying to achieve, albeit with two screens and a seam instead.